"The following passage from Vol. 3, No. 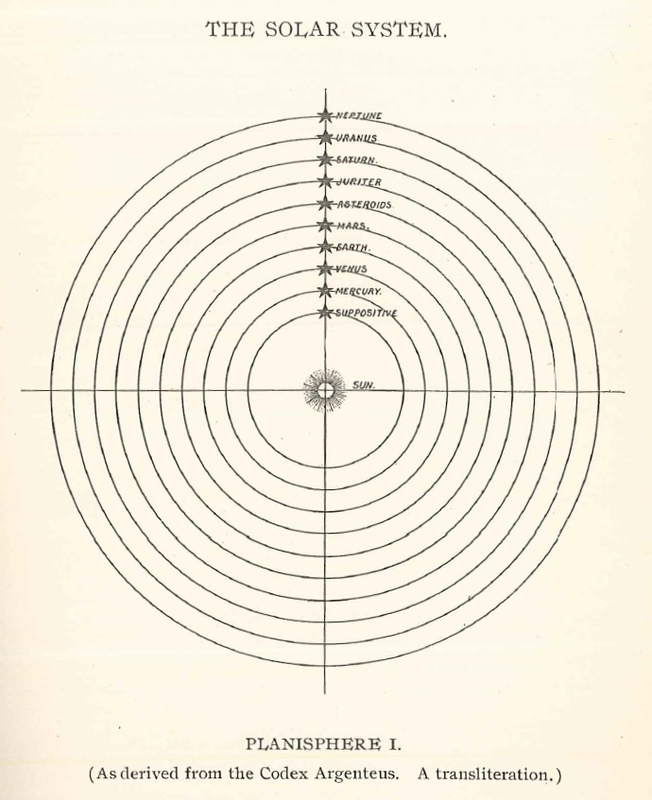 5 of "The Greater Light" will show how accurate the results were when the Mosaic Systems for determining the distances of the planets from the Sun was applied to verify the distance of the planet whose orbit is beyond Neptune: — it may not be out of place to mention here that "The Philadelphia Press" of October 20th, 1901, gives magnificent illustrations and descriptions of the brilliant theory advanced by Prof. George Forbes, of Anderson College, Glasgow, in relation to the existence of an ultra-Neptunian planet. The learned Professor, by abstruse calculation, fixes the distance of this planet at 9,300,000,000 miles from the sun. As, therefore, the distance of Uranus as Mosaically indicated by the Law just deducted is 1,859,544,000 miles from the sun, so, by this same law, 1,859,544,000 x 5 = 9,297,720,000 miles, thereby corresponding with the approximate distance of the Forbe's planet from the sun, which, consequently, by the Mosaic law, is the third beyond Uranus. From this stand-point another planet is demanded between Neptune and that of Forbes, at a distance of 4,648,860,000* miles from the sun." "We already had ten planets, and quit possibly more." 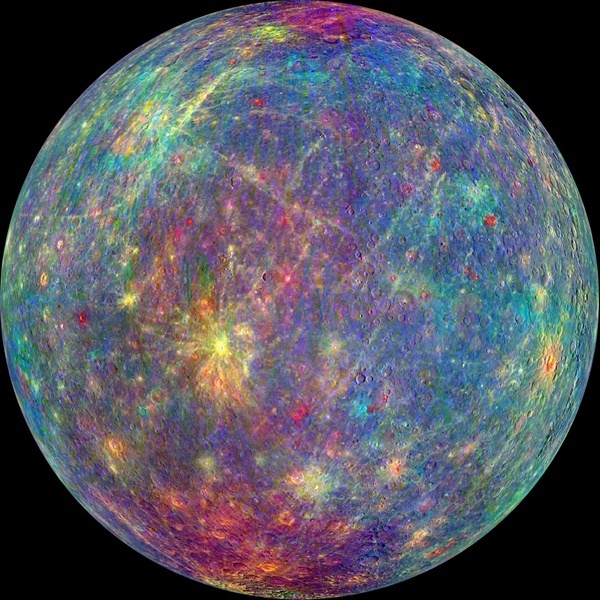 In further consideration of aggregate matter, by the Mosaic System the Sun has been displaced 4110 miles from the centre of the Solar System; possibly due to the disruption and vaporization of the Asteroid Planet. "In further investigation, where did planet Suppositive go? And just what symbol does it have?" 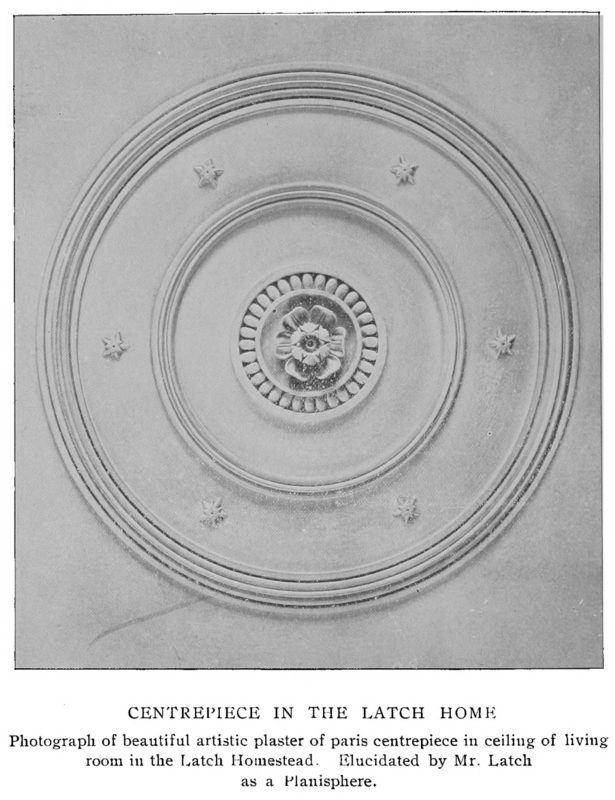 Latch elucidated its position from the Codex Argenteus in 1900. Has Suppositive imploded? Or, was it blasted away from one of the Sun's former MicroNova events? War in Heaven 31,754 B.C. The collision of two planets, Jupiter and Asteroid; this destructive war in heaven between the Archangel Michael and Satan in the beginning of the Euphratic age; the war being the passing of a red comet; electrically connecting to Mars. 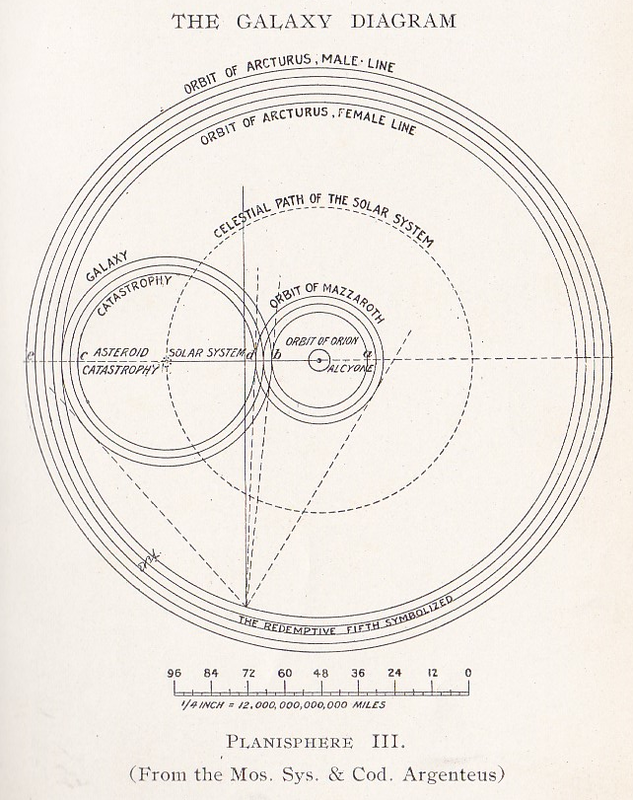 "The circumferential value of one special body unduly pressed may lead to its collision with another special body, and, in turn, to a more general collision as in the case of the Galaxy, and the Jupiter Asteroid catastrophes (see The Galaxy Diagram – Planisphere III)." Pluto lies at 2,771,400,000 Miles - 4,585,719,398 Miles (Average Range 3,678,559,699 Miles). On February 18, 1930, Tombaugh discovered the tiny, distant planet by use of a new astronomic technique of photographic plates combined with a blink microscope. But, is Pluto moving? Yes, is correct, and it could of been the original Belus of antiquity. Desribed as the "Tenth Planet" in the Popular Science at 4.7 Billion Miles. Only 51,140,000 mile difference. "From this stand-point another planet is demanded between Neptune and that of Forbes, at a distance of 4,648,860,000* miles from the sun." "Rich, along with Rennell and Porter, concurs in the opinion that the temple of Belus was built upon the site of the tower of Babel, but is at variance as to which of the two ruins, the Mujelibe or Birs Nimroud, is best entitled to the distinction: Rennell decides in favour of the Mujelibe, Rich and Porter incline to the Birs." Forbes or Ninus or Nemesis? The 50 billion mile published editorial piece is for now our Binary Companion, unless the real binary is at the 9.7 billion mile marker and called Forbes/Ninus/Nemesis, the "culprit of chaos". I am interested in the 4.7 printed number, as this matches the Mosaic postion as elucidatred from the Codex Argenteus by Latch. If you follow the math of Dr. Thomas below, it may seem we may even have more planets still.... So, where is the true binary? At 50 billion miles? On what "ring" as Chan descibes? #224? What do they preturb again? did he say Pluto pertubed by two or more planets? Yes, he did, and Latch just elucidated the mosaic distance to them, "them" being known as "Planet XII", and "Planet XIII". Or does this still need more interpretation? I think it demands it, as I am still not postive it is all correct just yet. The Bode-Titius relationship may give us a key to the answer. Titius and Bode, two German astronomers, discovered this relationship in the eighteenth century. If we take ring numbers, or orbit numbers, of the planets through Saturn (0, 1 , 2, 4, 8, 16, 32), multiply each number by 3, add 4, divide by 10, the series becomes (0.4, 0.7, 1.0, 1.6, 2.8, 5.2, and 10.0). 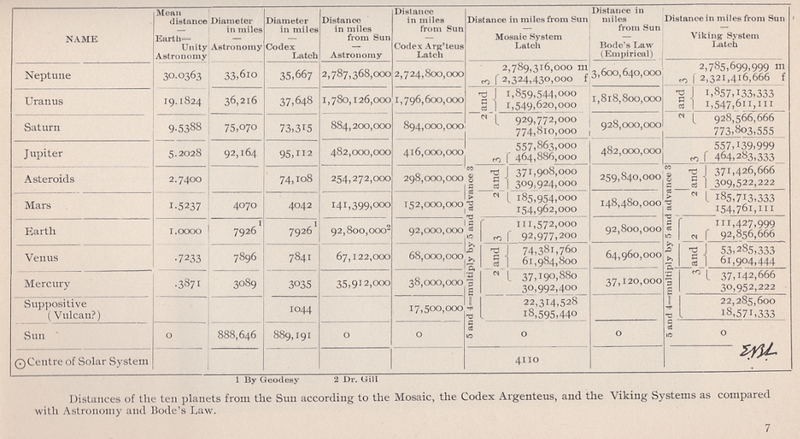 These numbers represent the relative distances of the then known planets from the Sun - Mercury, Venus, Earth, Mars Jupiter, and Saturn - with 2.8 representing a void with no known planet at that distance. When the planet Uranus was discovered in 1781, it fit right into the series at 19.6; the "law" seemed strengthened, and an intense search was started for anything that might be at the 2.8 distance. In 1801 the little planetoid Ceres was found at 2.8; by 1945 more than 1,500 more were found on the same orbit. It has been well established as the ring of minor planets, or planetoids, or asteroids. 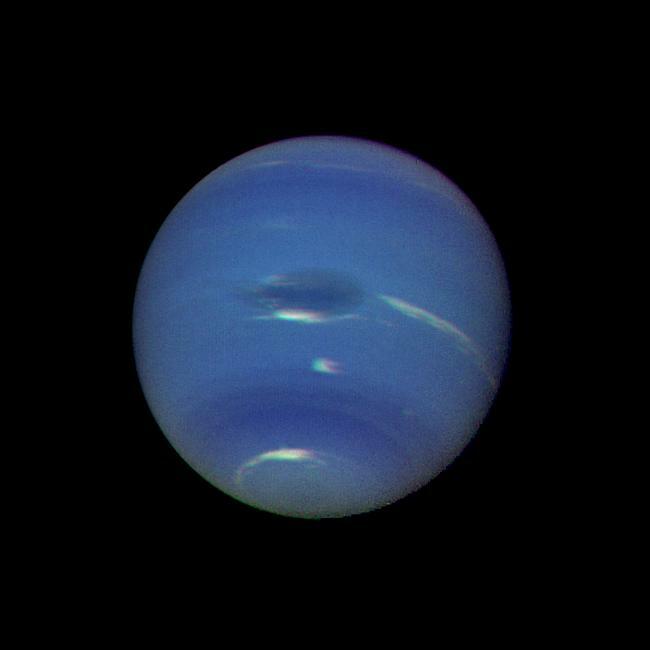 In 1846 Neptune was discovered - and it seemed to disobey the rules set down by Bode and Titius. It should have been at 38.8 on the relative distance scale - but it was closer to 29.2. 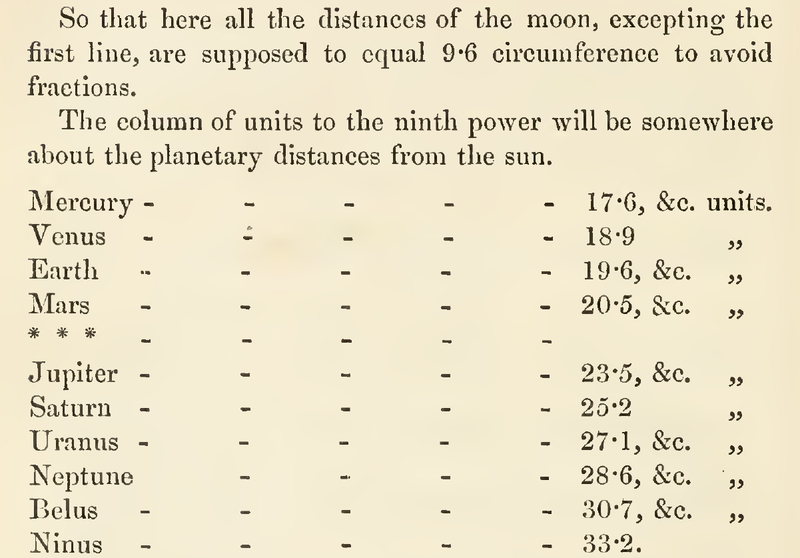 In 1930 Pluto was discovered, and Bode-Titius seemed to fall apart, for Pluto was found close to 38.8, where Neptune was supposed to be, whereas the Bode-Titius "law" seemed to indicate that Pluto should be at 77.2. Since then the relationship, commonly known as "Bode's Law", has been regarded in astronomy as nothing more than an insignificant curiosity. Perhaps a new look at Bode's law is in order. If so much of it is correct, then perhaps the part which appears to be erroneous seems to be so only because of our lack of understanding of the basics involved. First, instead of using relative distances, we shall work with ring numbers, or orbit numbers. The first progression (0, 1, 2, 4, 8, 16, 32, etc.) represents these numbers. Also, instead of this progression - which is geometric except for the zero - let's fill in all of the numbers, making a true arithmetic progression. The numbers will be 0, 1, 2, 3, 4, 5, 6, 7, 8, and so on to 256. Now in this progression the ring numbers 0, 1, 2, 4, 8, 16, 32, 64, 128 and 256 can be regarded as fundamental rings. All other rings can be regarded as harmonic rings. Between any two fundamentals, the ring which lies halfway between is the first harmonic; any ring which lies halfway between a fundamentals and a first harmonic is a second harmonic; any ring halfway between a second harmonic and a first harmonic, or a second harmonic and a fundamental, is a third harmonic, and so on. The next step is to label the ring numbers with the planets as they actually are positioned in the Solar system. We can simplify the table if we take all of the ring numbers up to 8, then only the fundamentals, 1st, 2nd, and 3rd harmonics to ring #256. The first thing we notice is that all of the planets are on fundamentals except for Neptune. 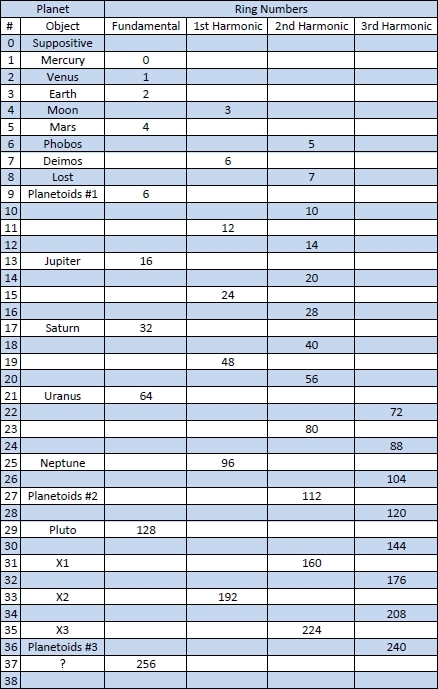 Its the only one of the planets which is on a harmonic ring, as it appears on the first harmonic between Uranus and Pluto, which are on fundamentals 64 and 128 respectively. Now we come to another discovery. The number of rings between planets increases the farther away from the Sun the planets are, until it appears that the maximum number of rings possible between planets is 31. On each 32nd ring there has to be a planet whether that ring is a fundamental or harmonic. That's why Neptune is on a harmonic, the 32nd ring after Uranus, with Pluto on the 32nd ring after Neptune. Something else appears apparent also: When the Solar system was born, planets tried to be born on each ring. Full-blown planets were born on every fundamental, and on any harmonic ring 31 rings away from any other planet. On all other rings, minor planets were born, or a ring of planetoids. Since there are four major planets inside the planetoids on ring #8, let's assume that the entire system is made up of three groups of four major planets plus a ring of planetoids in each group. This means that there may be two more undiscovered planetiod rings, #112 and #240. If we look at the minor planet rings on either side of Jupiter, and apply Kepler's laws to them, we find that the moons of Jupiter - even the retrograde ones - are explained as captured minor planets from both inside and outside rings around Jupiter. Before we examine the result of our construction, let's look into the outer unknown regions of the Solar system: Ring #256 is where the comets turn around and head back into the heart of the system. 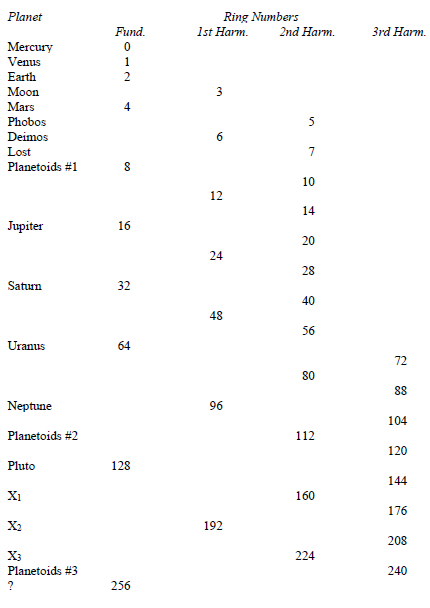 Further, it is known from the perturbations in Pluto's orbit that there is more than one planet outside Pluto; our table tells us that there should be three planets on rings #160, #192, and #224. The total number of rings tells us that there is a fantastic number of captured and uncaptured minor planets yet to be discovered. 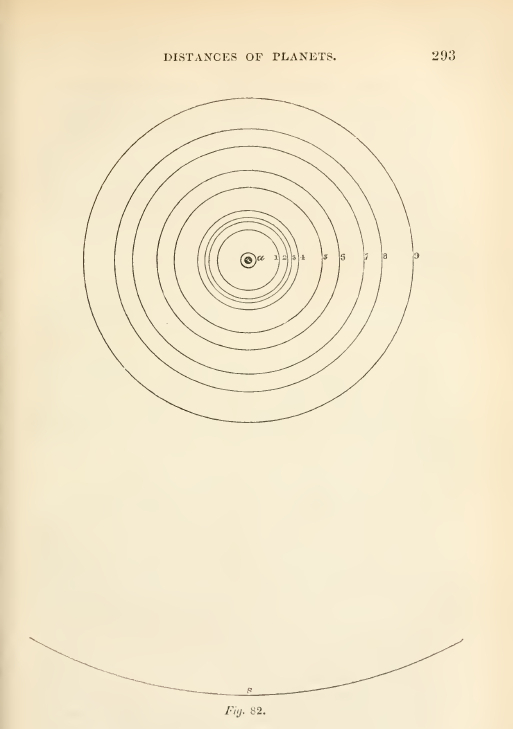 The junk of the Solar system - the first orderly interpretation of Bode's Law. How does adding "Planet Suppositive" change the chart? It's apparent that our present moon was created on ring #3, Phobos and #5, and Deimos on #6. Ring #7 is vacant. That presents a real challenge. Whatever happened to the minor planet from Ring #7? The closeness of Phobos and Deimos to Mars tells us that the rings #4, #5, and #6 closed together a tremendous amount, most probably through a succession of events in the Solar system causing the series of cataclysms on the Earth. It is logical that the ring #7 also would have closed towards Mar's ring so that Mars would have captured the minor planet from ring #7 as well as Phobos and Deimos. Once orbiting around Mars by the Earth and be the moon-satellite so well described on the Idol and Calendar Gate of Tiahuanaco. The multitudes of legends springing from the cataclysm of ~14,000 years ago about "Venus moving into orbit" or "Venus changing her orbit" most probably describe the capture of our present moon from ring #3 - which in its day, eons ago, evidently was a pretty fair planet orbiting around the Sun. 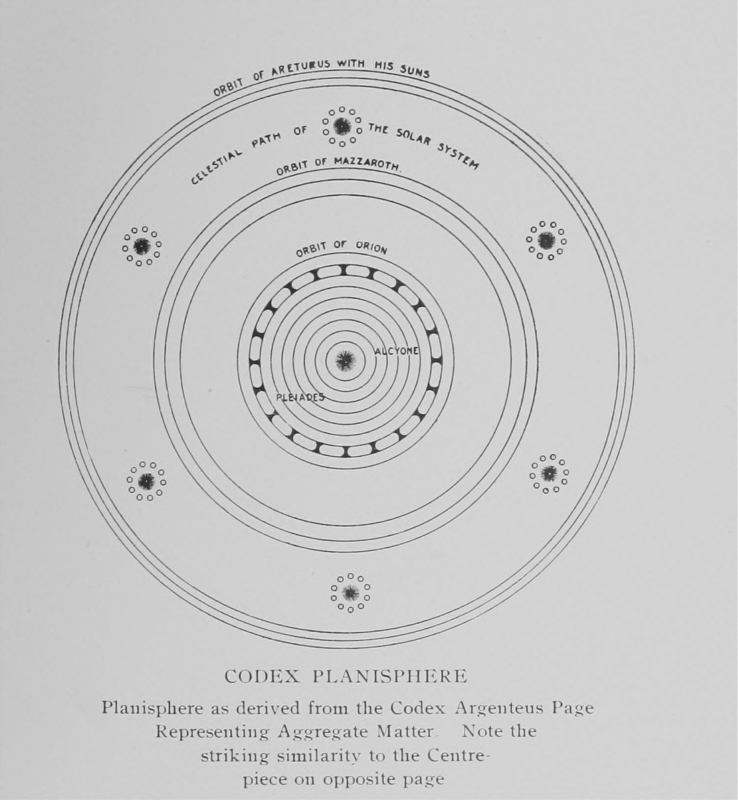 In any case, the now vacant ring #7, the records from Tiahuanaco of a retro-grade-orbiting moon, the plethora of impact craters on the moon and Mars, and the mountains of dense material buried in the mantle of the Earth as uncovered by perturbed orbits in our man-made satellites, and Bode's Law, expanded to include harmonics, now offer an orderly meaning to us.